The prayers of the members of the Congregation of Holy Cross are requested for the repose of the soul of Brother Bernard Palmeri, CSC, a member of the Moreau Province of Brothers and Priests. Born in New Orleans, Louisiana, Br. Bernard died in Austin, Texas, on December 24, 2018. He was in his 56th year of religious life in the Congregation. He transferred to Holy Cross School in New Orleans in 1957 along with several of his classmates. He was involved in a number of sports at Holy Cross including football and wrestling. He graduated from Holy Cross in May of 1962 and accepted the offer of Brother Edward Heller to spend a summer in Watertown, Wisconsin to see if he might want to devote his life to being a Brother of Holy Cross. He graduated from St. Edward’s University in Austin, Texas in 1968 with a Bachelor of Science Degree in Business Education and Accounting. He eventually earned a Master’s in Counseling at St. Mary’s University in San Antonio, Texas in 1980. He also eventually made his perpetual profession of vows on August 10, 1973 at St. Edward’s University. He also began a successful career as a teacher, coach and school counselor. He spent time at St. Anthony High School in Long Beach, California; at Holy Cross High School in San Antonio, Texas; at Archbishop Curley High School in Miami, Florida; and at St. Francis High School in Mountain View, California. He coached football, wrestling, track and soccer. He served as a full time mental health counselor at St. Peter/St. Joseph Children’s Home in San Antonio. As I think of the novitiate year I spent with Bernard, I recall it was marked by a certain struggle of wills between him and Brother Gerontius McCarthy, the novice master. For one thing, Brother Gerontius insisted on using the name Brother BER-nard with the accent on the first syllable. However Brother Bernard insisted that his patron was St. Bernard of Clairveaux and the accent belonged on the second syllable, spoken Ber-NARD (as in the dog). He never won that battle with Gerontius. Likewise, he lost his basketball scholarship when he lost his patience with what he considered Brother Gerontius’ less than ethical play; he responded too physically and was banished in the early morning hours of winter to shoveling coal in the furnace room. They always said what you are in the novitiate you will be for the rest of your days. Bernard graduated from St. Edward’s University in Austin, Texas in 1968 with a Bachelor of Science Degree in Business Education and Accounting. He eventually earned a Master’s in Counseling at St. Mary’s University in San Antonio, Texas in 1980. He also eventually made his perpetual profession of vows on August 10, 1973 at St. Edward’s University in Austin. There were several of us at that time who were putting off perpetual vows until the end of the ten year limit that the Constitutions permitted. There is a note from Brother Romard in the file wondering if Brother Bernard would petition and then make perpetual profession. Even before earning his bachelor’s degree he also began a successful career as a teacher, coach and school counselor. He spent time at St. Anthony High School in Long Beach, California; at Holy Cross High School in San Antonio, Texas; at Archbishop Curley High School in Miami, Florida; and at St. Francis High School in Mountain View, California. He coached football, wrestling, track and soccer along the way. He also took summer positions in child care agencies to get some experience. He worked at St. Joseph Farm for a summer. He served as a full-time mental health counselor at St. Peter/St. Joseph Children’s Home in San Antonio. He entered full-time work for the Province for a number of years, serving as a Candidate Director, a Formation Director, and a member of the Provincial Council. From 1985 through 1992 he served as the South-West Province Promoter of Vocations. That was probably one of the most difficult positions he had, although he enjoyed camping out in National Parks and state parks in the van along the way in his travels. And his efforts were remarkably successful among Brother vocation promoters of the time. In 1992, he accepted the call to help form a new religious residence in Beaumont, Texas, along with Brother John McLaughlin and Brother Roberto Jimenez. Brother Bernard began work for Catholic Charities in the Diocese of Beaumont as an Individual, Marriage and Family Counselor. Part of his work entailed working with the six elementary schools and one high school in the Diocese. 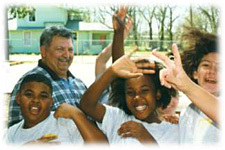 In 2000, he moved to full-time work with the schools, spending a portion of each week at each of the schools. In 2009 his physical health began to deteriorate rapidly, and he moved to the Brother Vincent Pieau Residence in Austin where he provided a number of activities and “swell prizes” to help keep the residents occupied. It is hard to decide where to begin in a reflection on the life of Bernard. I have known him to certain extents for more than 50 years. I do know that for him, life as a religious was not always easy. He was never quite comfortable with the life-long commitment asked of him and sought an indult to continue in temporary vows for additional years. It was the inconsistencies of how the common life was lived that affected him. He always joked that he mis-spoke his vows and said he was taking vows of poverty, celibacy or obedience and got stuck with celibacy. However in some respects obedience seemed the difficult one for him. He sometimes had difficulty with arbitrary decisions and statements of those in authority, especially those who did not practice what they required of others. It wasn’t just that no provincial would consider providing him with a boat until he was no longer able to deal with one. I have to take that back since Brother Richard Critz once provided him with a toy boat. But he overcame all the issues with the common life well enough that he was able authentically to invite others to join Holy Cross. I learned much about Bernard in my year living with him in Beaumont, Texas. And yet, the insight gained there is reflected in all the other times I came into contact with him. His passion was for relationships with people; for justice; for games (which he believed could help build relationships among people); and for fishing (because nature helped him build a relationship with God). Even in our earliest dealings with one another, Bernard was a sort of “social director” organizing us in games. We had a picnic at Golden Gate Park one year bringing together the local communities in Hayward and Mountain View. Bernard was in charge of the games. I recall Brother Gary Stone being quite skeptical of the whole affair and preferring to read the newspapers he brought along. He started the candidate program the province had in San Antonio. He chose a place where the winter winds would sweep into the house through the uninsulated siding. Some would say Bernard was frugal; others would say he was just darn cheap. But he never asked of others what he would not be willing to experience himself. He did put plastic pieces up to try to keep the wind out, but I am told by others it didn’t work too well; it was just noisy as the plastic flapped in the breeze. He also started our first joint immersion program bringing together students from several schools. Over the years this has been quite successful as an experience for students in learning Holy Cross values. The first one was in the Appalachian region and included Don Marengo and Sister Carol George, SSND, among others. How do you measure success in these cases? We met a couple of months ago a graduate of Holy Cross of San Antonio who went on this first immersion and met his Moreau Catholic High School wife there. That is one measure of success; but he is a middle school teacher today also and spoke highly of his experience of Holy Cross. I will say that sometimes the staff required more supervision than the students as Brother Michael Winslow and the late Brother Stephen Walsh would tell you. Bernard often met God in nature, especially through fishing. And fishing partners become very good friends through hours of being together. We are grateful to Milton and Ann Mello for their friendship and companionship with Bernard during his years in Beaumont. 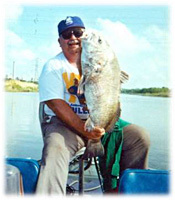 I loved travelling around with Bernard on the right side of Texas for whatever excuse it was; I was no fisherman. We visited the Alligator Nature Preserve, the Cajun Riviera, supported the Coushatta Indians in buying school supplies, supported the retired race horses at the race track casino, visited the birds at Pleasure Island in Port Arthur, and more and more. Our lives together were supposed to be a kind of immersion in Creation leading us to God. Just the other day we celebrated the anniversary of the death of another fisherman and neighbor of Bernard in his youth—Brother William St. Romain. I, Bernard Palmeri, pray that I can fish until the day I die. When it comes to my last cast, I then most humbly pray when in the Lord’s great landing net, and peacefully asleep – that in His mercy I be judged big enough to keep. Amen. I don’t think anymore needs be said. You are a keeper Bernard. – Father Michael Jamail, vicar general of the Diocese of Beaumont.